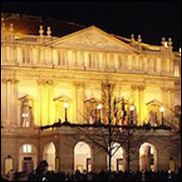 MILAN (VIP NEWS) — Milan's famous La Scala theatre has cancelled the start of its ballet season due to a strike by performers. Chorus members in the production of Romeo and Juliet walked out over a request by the choreographer to perform dance moves along with the ballerinas. The singers wanted special payments if they were to appear on stage. But La Scala claimed "nothing extraordinary" was requested from the performers and said it could not afford to pay any additional money. The chorus members' strike comes shortly after ballerinas involved in the production complained a sloping platform used in the performance had given them backache and muscle pain. A spokeswoman from La Scala said the dancers had now backed down from threatened industrial action, and were "really interested" to perform. The ballerinas "only wanted to focus" attention on "some difficulties of this stage project", she added. The chorus, however, has confirmed its intention to strike to the BBC. "It was not our intention to get the premiere cancelled," said Mauro Peconi, choir member and union representative. "The theatre's direction has closed the door to any negotiations and called off the premiere. We were willing to continue negotiations." Peconi said the new production of Romeo and Juliet "is different from others" as the chorus "are in costume" and "interact with the ballet". Appearing on stage meant that they would have to perform from memory, without a score. "So the contractual conditions are different and we should be compensated in accordance," he claimed. Wednesday night's premiere of Romeo and Juliet was to launch the theatre's new ballet season. A statement on the La Scala website said the opera house "deeply regrets" the cancellation of Romeo and Juliet and apologized to ticket holders. Peconi said the union would attempt to renegotiate with representatives from La Scala before the second performance, which is due to take place on 28 December. La Scala has been forced to cancel several performances in recent years owing to walk-outs by performers, in a country prone to wildcat strikes. In September 2011, an Austrian production of Beethoven's Fidelio was scrapped while in March 2012, the premiere of the ballet L'altra meta del cielo, had to be called off due to industrial action.